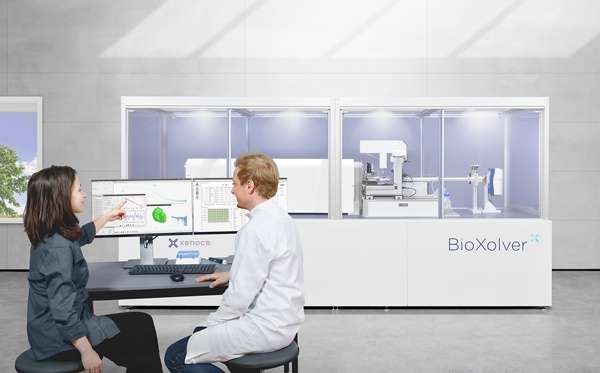 The BioXolver has been designed for biologists who need to have easy and fast access to high quality information on the shape and dynamics of macromolecules in solution. With the BioXolver, simply place your 2x 96 well trays on the instrument, and let the system run the measurements for you. Sample handling, sample cell cleaning & drying are all done automatically. Data analysis is run by the integrated automated software package. Just retrieve your data, remotely if you would like to. With the BioXolver you can focus on research. Another key benefit for biologists is the instrument very low sample volume consumption. With the BioXolver, save time & money! With its tubeless and automated sample handling, the instrument requires sample volume as low as 5 μL.